Anthony Terrell Seward Sampson was born in Billingham, County Durham. He was a British writer and journalist. His most notable and successful book was Anatomy of Britain, published to acclaim in 1962.He was the grandson of linguist John Sampson, of whom he wrote a biography entitled The Scholar Gypsy: The Quest For A Family Secret. At the age of 25 he went to Johannesburg, South Africa, to be editor of the magazine Drum, remaining there for four years. 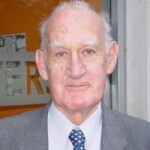 On returning to the United Kingdom he joined the editorial staff of The Observer, where he worked from 1955 to 1966. He was the author of a series of major books, starting with Anatomy of Britain, his main themes being how Britain works as a state, and large corporation. Sampson took an interest in broad political and economic power structure, but saw power as personal. He was a personal friend of Nelson Mandela from before Mandela ever became a political figure in South Africa. In 1964, Anthony attended the Rivonia Trial in support of Mandela and other ANC leaders. In 1999, he wrote an authorised biography about Mandela.